1 An old legend says that ladybugs are lucky. If you catch a ladybug and count the spots on its back, you'll have that many months of good luck in the coming year. Ladybugs really are good luck for gardeners and farmers. 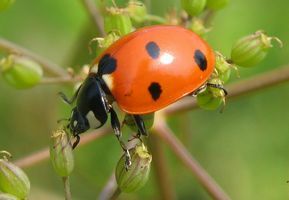 Ladybugs like eating aphids, which are harmful to plants. During its lifetime, one ladybug may eat as many as 5,000 aphids. 2 Ladybugs, which are also called lady beetles or ladybird beetles, have round bodies. Ladybugs are easy to spot because of their black spots and brightly-colored bodies. Ladybugs are usually red but can be yellow, orange, and even pink.